Solo Is Introducing Even More Star Wars Legends Characters Into Canon? With Disney and LucasFilm's Solo: A Star Wars Story hitting theaters in just under two months, new details have surfaced that claim even more characters from the Legends universe will be introduced into the Star Wars canon with this adventure. While there is no confirmation from the studio yet, a new report claims that alien creatures known as the Mimbanites will be shown on screen for the first time. There has previously been confirmation of other characters from the Legends universe debuting in Solo, so while it remains to be seen whether or not we'll get confirmation about the Mimbanites before release, it wouldn't be surprising to see their inclusion. For one, there has already been confirmation that the Mimbanites' home planet of Mimban will be featured in Solo: A Star Wars Story, which is where Han Solo (Alden Ehrenreich) and Chewbacca will be trying to escape from, after being captured by Imperial Mudtroopers. This report also claims that the alien inhabitants of this swamp planet known as Mimbanese will be seen, who are described as alien creatures with pointy hair. When exactly they are introduced in the movie, and how long we'll see them for, remains a mystery. 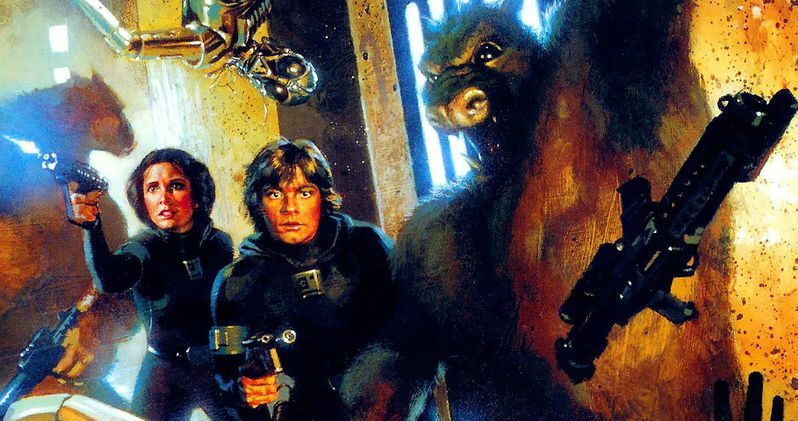 The Mimbanites, and the planet of Mimban itself, were both introduced in the 1978 Star Wars novel Splinter of the Mind's Eye, written by Alan Dean Foster, which was a direct sequel to A New Hope. The story followed Luke Skywalker and Princess Leia as they get stranded on Mimban. There was also a comic book adaptation of Splinter of the Mind's Eye which showcased the Mimbanites as green alien creatures, who do have pointy hair. Mimban was originally created as one of the Bog Planets in the earlier scripts for A New Hope, but it was ultimately used first in the Alan Dean Foster book. Mimban was first referenced in the Star Wars canon almost a decade ago, when it was mentioned in an episode of Star Wars: The Clone Wars first season back in 2008, but this movie will be the first time we'll actually see the planet. The Mimbanites join beloved Legends characters Tag and Bink, played by writer Jon Kasdan and Toby Hefferman, who were first revealed in a set photo shared on social media by director Ron Howard. It was also confirmed through a toy description that the Cloud-Rider gang from 1977 Star Wars comics will also be featured in this story, led by the main villain. There was also a tweet this past January from LucasFilm Story Group member Leland Chee, who told a fan that, "You wouldn't believe some of the Legends characters that will be cropping up in various media in the coming months. Hey, if Tag & Bink can show up, ANYthing is possible." While this tweet from January doesn't offer any confirmation that the Mimbanites will be featured, it seems plausible. This report from the Spanish site La Fosa del Rancor, courtesy of Star Wars News Net, also clarifies the reports of new director Ron Howard hiring an acting coach for Alden Ehrenreich. While that report is true, it's not as severe as once thought, with the director largely pleased with Ehrenreich's work, but he wanted to bring in an acting coach to improve certain dialects when the actor was stating certain phrases. You wouldn’t believe some of the Legends characters that will be cropping up in various media in the coming months. Hey, if Tag & Bink can show up, ANYthing is possible.